The first thing I want to do after I have had a long day or a bad day or a day that is both, is to hug an animal. Growing up, I have always had at least two cats and one dog, so the animal hugs and cuddles were easily accessible. After moving out and not being able to adopt an animal, the animal cuddles are non-existent. And the long, bad days sometimes are far too frequent. So when I heard about a Cat Cafe opening in Atlanta, I was beyond pumped. You mean I can visit a place where I am surrounded by cats at almost any point of my week? Sign me the heck up. I was finally able to visit Atlanta’s original cat cafe, Java Cats, last weekend with three friends. (You know you have the right friends when they agree to pet cats with you on a rainy Sunday afternoon). And as I suspected, it was a magical place. Since it is a cafe, they have a sitting area where my friends and I sat and sipped on tea while waiting for our hour session to start. And luckily, while we enjoyed our drinks, we were able to peer into the cat area by way of wall length windows. Once a woman came out to tell us we could come in, we walked into the cat room and were instantly transported to a feline haven. 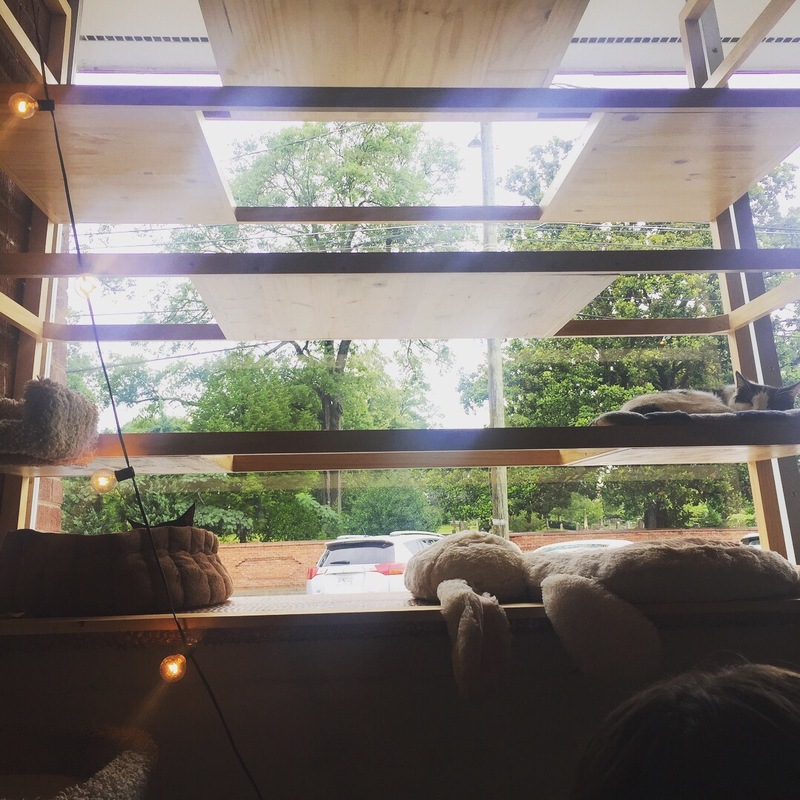 Platforms were hung from the ceilings and jutted out of the walls for cats to walk and lounge on. Scratching posts were not scarce. There were toys and treats galore. There were also plenty of seating options for hanging out, but my friends and I opted to sit on the floor to get optimal cat-face-time. Walking right in, the smallest kitten came bounding up to us That cat was the favorite of the day among the visitors. Since cat live my ideal life and sleep most the day, about half the cats were catnapping. However, that didn’t deter me from getting a few gentle pets in without waking them. Another small cat would walk by us on the floor and pause to contemplate whether she cared to play with us or not, and almost always opted for not. To each their own. When you have a whole room of people giving you attention, you deserve to be picky. The defining moment of our visit was a white cat who took a break from bothering the sleeping cats to try to show off for us by trapezing across some ceiling pipes. However, halfway through, he realized this was a task he was not ready for and got stuck. As a volunteer tried to sweet talk him off the ledge, we held our breaths in anticipation. Luckily he got down, and everyone cheered. This happened two more times when the same cat decided he wanted to make the same mistake with more platforms in the cat room. Nearing the end of our time, one cat woke up and strutted through the room to say hi to everyone in a single file fashion. One ear was torn, and he hung out with us on the floor for 20 minutes. Later, I found out from social media that he and some of the other cats I saw that day, including the trapezer, were adopted. It made my heart happy. Definitely one of my favorite Sundays I have ever spent in Atlanta. Even with just one visit under my belt, I plan to go back to Java Cats more, maybe some days I will venture in for a cup of coffee and to glance at the new cats, and other times I may need some more quality cat time. The whole experience got me thinking of how important these new animal cafes are. Not only is it a place that helps the animals involved, it can also help those coming to visit just as much. Not only have some studies shown that petting cats may help with lowering blood pressure and have overall therapeutic benefits, just spending time surrounded by cats and the people who love them can be heartwarming and relaxing. Much like a silent walk in nature, a quiet hour on a fur covered couch can do someone well. And for those who think they don’t like cats – I say give them a chance. If you love animals, but don’t have the time or energy for a dog, cats are low maintenance while still giving you the animal companion you need and deserve. Also, you may think cats are you mortal enemy, and then you walk into a cat cafe, see a little whiskery sweetheart and change your mind. I dare you to try. Besides Cat Cafes, what kind of animal cafe are you hoping to visit soon? Ahhhh! I have always wanted to visit a cat cafe! Now I am most def . going to visit this one if I am ever in Atlanta!